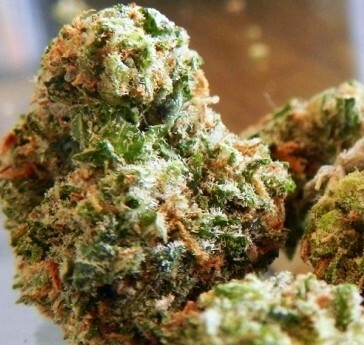 Just as the name suggests, Strawberry Milkshake is an incredibly delicious marijuana strain. It is an evenly balanced (50% Indica / 50% Sativa) hybrid strain created by crossing the flavorful Strawberry Soda and White Fire Alien OG strains. Strawberry Milkshake have compact buds that are spade-shaped. Its nugs are forest green in color with bright orange furs, highlighted by dark purple undertones and bright amber trichomes. Strawberry Milkshake combines the fruity flavor of Strawberry Soda and the earthy pungent richness of White Fire Alien OG. The aroma has a light earthy note but still maintains the fresh, fruity strawberry milkshake effect. The effects of Strawberry Milkshake creeps up on you, suddenly delivering a rush of euphoria infused with a delightful haziness. This cerebral activity eventually turns to a feeling of extreme relaxation, as it gently calms an overactive and racing mind. The hybrid effects are well balanced and this makes it ideal to be consumed at practically any hour of the day. You can expect laughter, a boost in energy levels, and a noticeable weight in the eyes. Strawberry Milkshake is extremely relaxing, soothing, bliss-inducing, and sometimes sedating, which makes it ideal for the treatment of mental disorders like depression, anxiety, and acute stress. It also alleviates the symptoms of chronic fatigue, headaches, migraines, and insomnia. Very energetic, yet relaxing high. Awesome!